Over 400 million people visit National Parks and US Forests each year. Hikers, rock climbers, and tourists alike come to escape the stress of everyday life. But wild areas are not without risk. Bear attacks are one concern, but you also have to be aware of other park visitors and the threats they pose. Pepper spray is a great way to arm yourself against bear and human attacks when you’re out in the wild. But how do know what kind of pepper spray to carry? 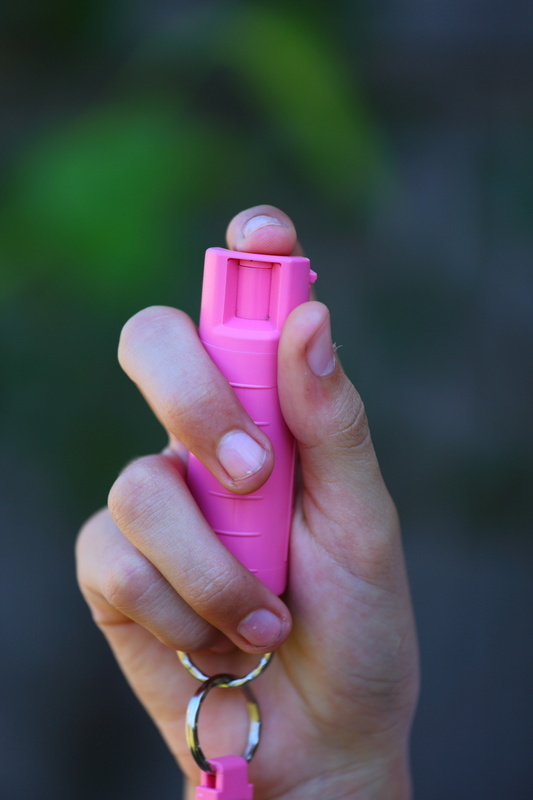 Read on to learn more about how to protect yourself with pepper spray. Pepper spray is an inexpensive item you use for self-defense. Its active ingredient is the chemical oleoresin capsicum. This chemical is what makes peppers so hot, and it is highly concentrated in pepper spray. How hot is it? Heat in peppers is measured on the Scoville scale, with bell peppers being the lowest and jalape?o peppers scoring anywhere from 2,500 to 5,000. Notoriously hot ghost peppers score anywhere from 855,000 to over 1,000,000.
Pepper spray is even hotter. Commercial pepper sprays are 2 million Scoville units, and police pepper sprays are a whopping 5.3 million Scoville units. Bear sprays use the same ingredient, though they are less concentrated. Pepper spray’s effects are intense. It stops your attacker by temporarily blinding them and causing them to experience boiling sensations in their eyes. The effects of pepper spray generally last 30 to 45 minutes, giving you ample time to get away from your attacker. There many different types of pepper sprays on the market. Each type works well for a particular need or use. Here are the different pepper spray features. If you’re comparing two same-size pepper sprays, you’ll have the option of long range or a higher number of shots. A shot is measured in time, not volume of product released. A single shot amounts to about half a second, so a whole canister generally only lasts for about 10 to 15 seconds. Many people prefer long-range because it keeps their attackers further away from you. Long range shots use more spray and run out quicker than pepper sprays with shorter ranges. Sometimes this means you’re only able to get one shot from your pepper spray. Pepper sprays with shorter ranges have their benefits as well. You’ll have more than one opportunity to use your pepper spray because a single shot won’t drain the whole can. This means you can test it throughout the year and it works well when you have multiple attackers. If you want a long-range shot and multiple shots, you’ll have to carry around a larger can. There are four main types of spray patterns: stream pattern, fog pattern, foam pattern, and gel pattern. Each one has a different type of use. Stream spray patterns are like shooting water out of a water gun. They have an average range of ten feet and work best outside. There is little risk of the spray blowing back into your eyes if it’s particularly windy when you release it. Stream sprays need more accuracy than other types of spray patterns. You can buy practice sprays if you’re not confident in your accuracy. Fog spray patterns come out in a fog pattern to cover a broader area. They can spray out to 25 feet away. Be careful with fog sprays when it is windy because the wind can blow it back towards you and other bystanders. You don’t need a whole lot of accuracy for fog sprays to be effective, which is good because their long range means you can deplete the can with one shot. Fog sprays are great for defense against bears. Foam sprays spray out like shaving cream and are best for indoor use due to their short range. The foam prevents spray from getting on unintended targets, but it also requires greater accuracy when you spray it. Gel sprays are like foam sprays, but with longer ranges — up to 15 feet. You want to make sure to buy a pepper spray that isn’t going to injure you instead of protect you. Getting pepper spray on your skin is an unpleasant experience, to say the least. Look for pepper sprays with safety features to prevent this from happening. The two most common safety features are flip tops or a sliding cap. Both are effective, but you should pick the feature that you’re most comfortable with using. Standard pepper sprays only use oleoresin capsicum as their active ingredient. Others have added ingredients such as tear gas or UV dye. UV dye helps police identify an attacker and tear gas makes the spray more potent. Be sure not to buy water-based practice sprays for self-defense. Buy these only if you need to increase your accuracy. True pepper sprays are oil-based which is what makes them so effective. It all comes down to where you plan on using the spray, who you think your target is, and how do you plan on carrying the spray. If your main concern is bears or other wildlife, you can buy bear spray which comes out in a fog pattern but has less heat than regular pepper spray. Carry all bear spray in a place that is easily accessible when hiking. If you’re concerned about other people, then you have a lot of options available. Try keeping short range foam sprays in your tent or camping trailer and carry long-range fog or stream sprays when you’re out. Every state allows you to carry pepper spray, but many have laws that restrict the maximum size or weight of the canister. There also may be laws about ingredients, usage, and people who can buy it. Your local store can fill you in on these laws, but be sure to do some research if you’re going out of state with the pepper spray. There are many pepper spray options to choose from. You have to weigh your needs when deciding which one to purchase. If you use this guide you’ll be in good shape for your next hiking or camping trip. Pepper spray is an aerosol spray product that is used for self-defense. When sprayed into the eyes, nose, and/or mouth it acts as an intense irritant to the eyes and respiratory airways, rendering an assailant temporarily disabled and allowing the victim to get away and get to safety. Pepper spray does not prevent breathing or interfere with the cardiovascular system. Its effects are temporary and there are no lasting side effects. Pepper spray contains an active ingredient called capsaicin, which is a chemical that is derived from the fruit that comes from plants found in the genus capsicum. This chemical causes inflammation of the eyes and respiratory passageways resulting in temporary blindness, burning of the lungs, discomfort, and shortness of breath. Pepper spray may also contain an ingredient called oleoresin capsicum, which is a chemical derived from hot cayenne peppers. The active ingredients in pepper spray are all-natural and plant-based, with no synthetic additives that could cause long-term harmful effects. How is pepper spray used? Pepper spray is used by spraying it directly into the face of the individual who needs to be subdued. It gets into the eyes causing swelling and temporary blindness and into the mouth and nasal passages where it causes intense burning, discomfort, and shortness of breath. It does not prevent breathing altogether. Pepper spray is used for personal self-defense and safety. It is also used by law enforcement officers for crowd control and to subdue individuals who may pose an immediate threat to themselves or others. How long do the effects of pepper spray last? Depending on the percentage of the active ingredient capsicum contained in the pepper spray, the effects can last anywhere from 30 to 45 minutes. Some brands of pepper spray contain only 2% of the active ingredient, therefore the effects wear off sooner. However, most sprays contain a standard 15% of the ingredient and will be effective for the 30 to 45-minute time frame. In some instances, prolonged effects have been reported, some lasting for as long as 60 minutes. Depending on the amount of pepper spray the individual is exposed to, the effects can take longer to wear off. In instances where an assailant may need to be sprayed more than once, the higher concentration of pepper spray they receive to their airways, eyes, and skin will result in longer-lasting and somewhat more severe effects. What does pepper spray feel like? Those who have experienced the effects of pepper spray firsthand describe an extremely unpleasant burning sensation in the eyes, knows, mouth, throat, lungs, and on the skin. The eyes burn and itch intensely, and they swell shut so that it is impossible to see until the effects of the pepper spray wear off. Many describe experiencing uncontrollable coughing which increases the pain and discomfort in the lungs, throat, and respiratory passages. Can pepper spray be harmful to the user? Pepper spray cannot harm the user unless it gets onto the skin and is then transferred to the facial area. Simply deploying the pepper spray cannot harm the user. Extreme care should be taken, however, not to inhale any of the spray as it is being used. It is also important to wash hands thoroughly and wipe off the entire pepper spray canister after deploying the spray in order to avoid coming into contact with any residue that may have found its way onto it during use. Yes, pepper spray is legal. In some states, however, possession/use of pepper spray may be regulated, and in some jurisdictions, it may be prohibited by law. It is a good idea to check with your local police agency regarding current pepper spray laws. Is there an age restriction for possessing pepper spray? In some states or jurisdictions, pepper spray may only be carried by a person who is at least 18 years of age. Check with your local police department to find out if there are any regulations in your area. Pepper spray has an average shelf life of 3 to 4 years. After that, it can lose its potency and effectiveness and will need to be replaced. An expiration date can be found stamped somewhere on the canister. Where can pepper spray be purchased? Pepper spray can be readily purchased online, including from well-established wholesale pepper spray suppliers like Safety Technology. It can also be found in the sporting goods/hunting section at your local “big box” retailers , firearms shops, army surplus dealers, and in most sporting goods stores. Want more helpful information about camping, hiking, or survivalism? Check out our blog!